After the fall of Liege and Namur, the plucky Belgian army had retreated before the German hordes to the strongly fortified city of Antwerp, one of the largest and richest of all the ports in the world, with a population of 350,000. The Belgian court and King Albert's government had also retired within the Antwerp lines. Here the army of 120,000, commanded by General Moranville, awaited the siege that was sure to begin. 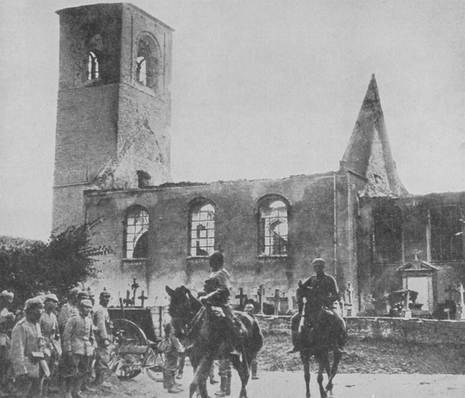 On August 23, 1914, the day of the battle of Mons, the Belgians learned that a large German force had been withdrawn from Belgium to assist in the attack on Mons. 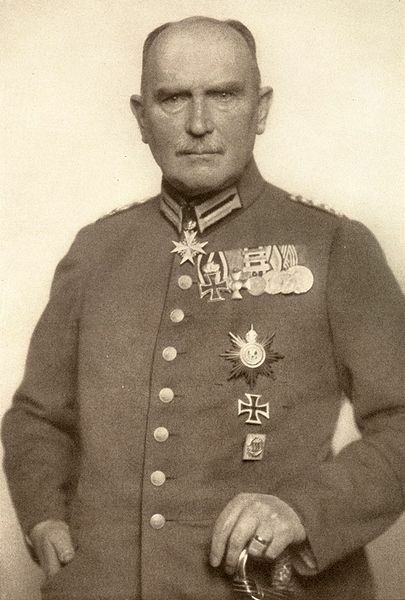 To relieve the pressure on the Allies by compelling the return of these German armies, General Moranville marched a single corps south and drove the Germans out of Malines. 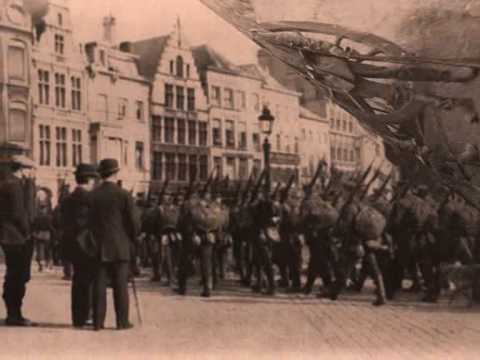 In retaliation, the Germans flew a Zeppelin over Antwerp, and several civilians were killed by the explosion of bombs. Continuing their march, the Belgian army spread out, on a line from Termonde to Aerschot, capturing Alost, laying siege to Cortenburg, and threatening the German communications. 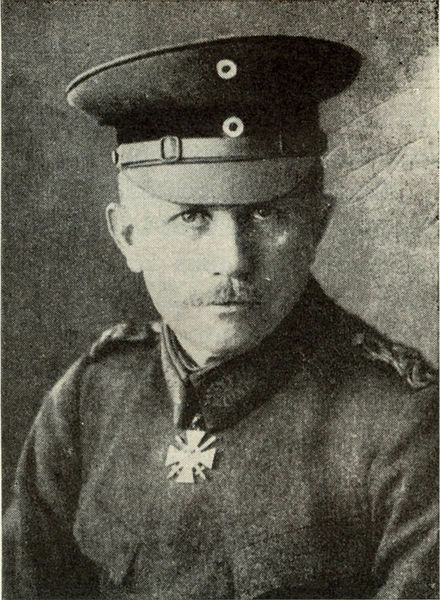 Fearing von Kluck's flank might be attacked, the German high command hastily recalled the army of von Boehm from Mons and the army of General Beseler, which had been held in reserve at Lille. The new German army, now numbering 200,000, went in pursuit of the Belgian corps, numbering 50,000, which had meanwhile taken Aerschot and Louvain. 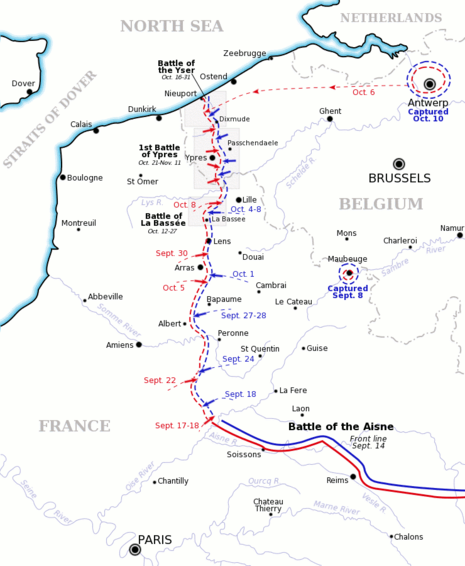 A four days' battle was fought, September 13, 1914 to September 17, 1914, on the line of the Malinès-Louvain railroad, resulting in the retirement of the Belgians to Antwerp. The Belgian army, however, had attained its object; which was to compel the recall of the German reinforcements, and the consequent relief of the pressure on the British and French armies at Mons and Charleroi. The siege of Antwerp began September 28, 1914, when the huge German howitzers opened fire on the forts south of the River Nethe. The German guns had an effective range of seven and one-half miles, while the utmost range of the Belgian howitzers was only six miles. The Antwerp forts, therefore, were doomed from the beginning. Two of the forts were quickly silenced. On the third day of the siege, the Germans shelled the main waterworks of Antwerp. The dyke gave way and the water flooded the infantry trenches which had been dug between the forts, submerging the field guns and depriving the city of all its water supply except that drawn from artesian wells. Meanwhile, the Belgian army was being forced back across the Nethe River as each outlying fort collapsed. 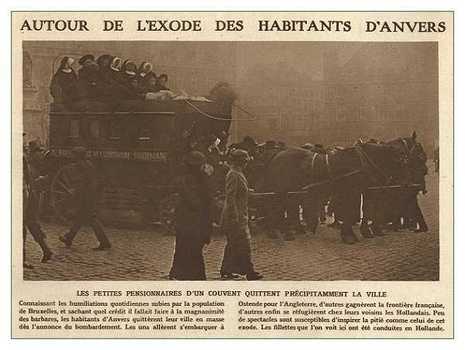 The doom of the city was sealed on Friday, October 3, 1914, when the Belgian government prepared to transfer to Ostend. The evacuation of the civilians already was in progress, when a detachment of 6000 British marines arrived, in command of Brigadier General Paris, and accompanied by Winston Churchill, First Lord of the British Admiralty, who requested that the Belgian army postpone its evacuation till further reinforcements arrived. Against his better judgment, King Albert agreed. 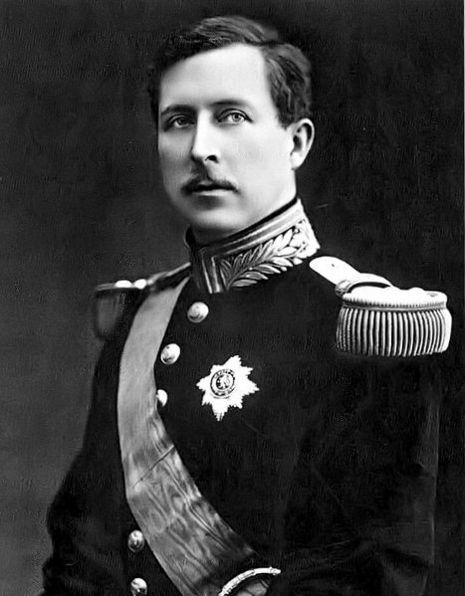 When first he had appealed for British aid, some days before, King Albert had expected that an army of 50,000 would be sent to the succour of Belgium, and no doubt the British would have been glad to have sent that number could they have done so. Lord Churchill could only spare 6000 men in Antwerp's grave crisis, and this number, of course, could render no effective aid. He has been criticized by English historians for having urged King Albert to delay the evacuation of Antwerp until the entire Belgian army was in immediate danger of capture. For this blunder, Churchill was relieved from office and given a colonel's commission in the British army. The evacuation of the Belgian army was so long delayed that only two-thirds of the forces were able to escape toward Ostend and Ghent. 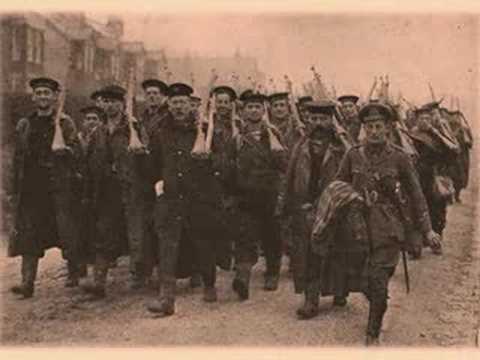 Full 30,000 Belgian and British soldiers were driven into Holland, where they were interned for the remainder of the war. 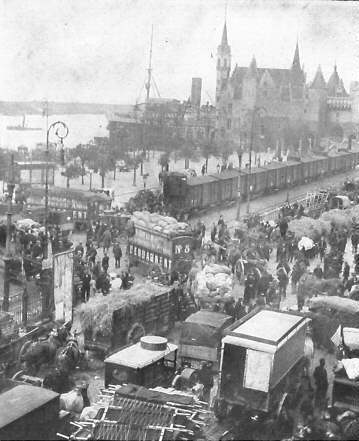 As the German besiegers closed in on Antwerp, the inhabitants of numerous adjacent towns fled for refuge into the city, until 500,000 civilians were centered there. On October 7, 1914, Antwerp was in a state of panic, as the roar of the German howitzers drew nearer. Fearing the fate visited upon the people of Louvain and Aerschot, the Antwerpians prepared for evacuation. Then ensued one of the wildest scenes in modern history—a whole population of 500,000 in panic flight. Before nightfall 250,000 had escaped from the doomed city, some by water, others by land. The harbor was alive with crafts of all descriptions, submerged to the water line with the weight of their human freight. Many thousands escaped to Ghent; some 200,000 exiles on foot managed to reach Bergen in Holland, without food and penniless. Infants were prematurely born on the way and many elderly persons died by the wayside from exposure. The good people of Holland shared their food and shelter with these refugees. Meanwhile, the military authorities in Antwerp had set fire to the petroleum tanks on the left bank of the Scheldt, and the dense black columns of smoke covered the doomed city like a pall, while masses of seething flames illuminated the foreground. Conflagrations had broken out in several parts of the city, and the incessant roar of guns, meteoric showers of fiery projectiles, and bursting of shells completed the frightful impression of a stupendous outbreak of baneful, unearthly forces. The Belgian army found itself desperately outnumbered by the Germans and was limited to conduct a fighting retreat from the onset of the invasion. Early on in the campaign, the Belgian army had to relinquish control of the fortified cities of Liège (August 16) and Namur (August 24). October 5 was a crucial date during the Siege of Antwerp; the German army broke through the Belgian defences in the town of Lier, 20 kilometers southeast of Antwerp and moved on to the town of Dendermonde (south of Antwerp) where it attempted to cross the river Scheldt. This pincer movement of the German army threatened to block the western retreat route of the Belgian army out of Antwerp. With its eastern and southern flanks being blocked by German troops and its northern escape route closed off by the Belgian-Dutch border, the Belgian army evacuated Antwerp via a series of pontoon bridges over the Scheldt and left the city to its own defenses.